MIT professor Russ Tedrake watched the robot Atlas open a door in a campus building in 2015. The robots may eventually come to take your job. But first, they’ll have to figure out how to take the elevator. Boston is home to a growing number of companies that are building or selling robots intended to roam free in human environments — rolling along sidewalks, climbing the front steps to drop off a package, entering conference rooms, and inspecting the engine of a broken car in a repair bay. And every one of them is grappling with a maddening range of obstacles that we humans don’t think twice about. How many different types of doorknobs will you encounter today, and how many of those doors will be locked? How many acorns will you crunch on the sidewalk? 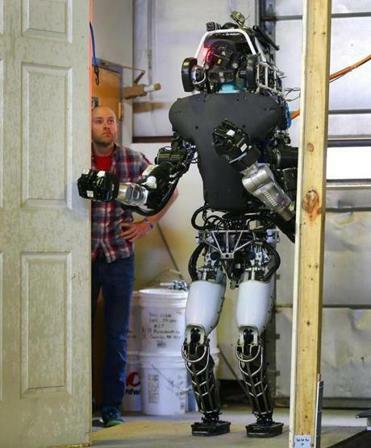 In 2013, I witnessed the cutting-edge of robotic door opening at MIT, when a team of researchers used a million-dollar robot named Atlas to try to open a door with one of those lever-like handles that runs parallel to the floor. One person worked a rope-and-pulley system that kept the expensive robot from falling down. Hydraulics whined loudly, and a siren on the robot’s head warned humans to keep a safe distance. After a few minutes, the bot successfully opened the door. A few more minutes passed as it maneuvered through the actual doorway — sideways, since Atlas was too large to fit through the regular way. Total elapsed time: about 10 minutes. Hurdler Motors, a startup based in the Mass Robotics space, is designing a robotic cart that would help deliver packages to your doorstep. Its robot would ride on a delivery truck, and then dismount to navigate streets and sidewalks while carrying a small load of cargo. The Hurdler device is even designed to climb stairs to get to a front porch or entryway. Initially, it would work alongside a delivery person to carry more stuff than they can with a handcart today; eventually, says Michael Goren, the company’s founder, it would operate on its own. The design involves six or eight wheels fixed to the end of post-like legs that can move up and down to ascend stairs or get around obstacles on the sidewalk. “If a kid lays down a bicycle on the sidewalk, that stops all those guys,” says Goren, referring to competitors that are designing rolling robots that just have regular wheels. “We can surmount those obstacles where others can’t.” But Goren says his plan for opening doors or pushing elevator buttons is that other companies will design arms to do those tasks, which could be added onto the Hurdler system — or that everything will eventually have wireless communications built into it, so the robot can silently request to have a door opened. He’s hoping to raise a few million dollars to turn the company’s prototype robot into a marketable product. But the Roomba does a job most of us dread, and it’s relatively cheap — about $375. A much more expensive product from the company, the Ava 500 videoconferencing robot, failed to take off. The Ava looked like a motorized column with a TV screen perched on top; it sold for $70,000, or could be leased for about $2,500 a month. So imagine you bought one, and put it on the executive floor so that the boss could “beam in” to meetings via robot, or amble around checking on underlings. If the robot wanted to get down to the accounting department or the warehouse, it couldn’t. “It costs you something like $20,000 per elevator to create a wireless interface so that Ava could call an elevator,” says iRobot CEO Colin Angle. “It was cheaper to buy two Avas for separate floors than getting it to ride the elevator.” To get through a closed door, Ava would wait for a person to come along, with a message on the video screen asking for help. Angle recalls that when he was an MIT student, he worked on a robot named Seymour that was designed to carry candy on board to try to bribe humans to open doors and push elevator buttons for it. But even the world’s biggest companies didn’t seem to want to invest in an Ava for every floor of the building. So starting in late 2016, iRobot decided to spin off the videoconferencing bot as an independent company, Ava Robotics of Cambridge. A new version of the robot will be unveiled next month, according to Marcio Macedo, a former iRobot executive who is a co-founder of Ava Robotics. Macedo says they have been beta-testing the new version at the MIT Sloan School of Management, where participants in executive education programs can virtually come to class, even if they can’t hop on a plane to be there in person. Sometimes, people “beaming in” to the robot do ride the elevators, but by asking humans to press the button for them. (MIT also has Wi-Fi in its elevators — a key requirement for maintaining a link to the roving bot.) But even Macedo admits that even if a robot was able to work in an environment where every door could be opened automatically by waving a security card, would we want to give it the security card? “Security teams might worry that someone would ‘piggyback’ behind the robot when the robot was opening the door” to sneak into a locked area, he says. Would the robot know? Some of my favorite buildings in Boston are those with elevators ancient enough to require licensed human operators. I think if the robots want our jobs, they can work at those addresses, and politely ask the operators for a lift to the third floor. But they may still want to bring some candy.